October’s bakes and I also highlight what I made from the collection! Already we’re into November, which not only means I can begin thinking about how I’m going to celebrate my birthday, but it also means the start of a new #BakingCrumbs linky and a look back at the amazing treats and bakes shared by some fabulous bloggers during October. Last month saw an a huge 29 recipes linked up to the #BakingCrumbs linky. Yes 29! That’s so amazing considering it’s such a new linky! Thank you so much to everybody who linked up and shared the baking fun. ? To continue with the baking fun I’ve opened a new FaceBook group called ‘Baking Crumbs‘ which you’re welcome to join! And no, you don’t have to be a blogger to join in the baking fun! Here you can share images of your recent bakes (successful & perhaps less so), ask fellow members for advice on baking techniques & ingredients and even share the joy of a new product which has improved your baking exploits! It’s perhaps no surprise that we saw many amazing seasonal recipes linked up in October. There were many pumpkin recipes (perfect if you’ve got some pulp to use following your Halloween mischief), some warming recipes which will be great for bonfire night and let’s not forget the scary Halloween bakes which I must encourage you to ‘pin’ ready for next year’s mischief! Although GBBO came to an exciting finale last night, which means that ‘the blogger’s bake along‘ will finish for another year, I am envisiging some inspiring Christmas bakes starting to be shared soon! With that in mind I’m more than happy, if you’re a blogger, for you to continue linking up to 3 recipes per month. thumbnail images in this month’s ‘linky’ towards the bottom of the post. So, yes, Halloween has passed for another year but there’s nothing stopping you from pinning these great bakes for next year’s inspiration! Don’t you just adore the ghost topping Kate’s gluten free Pumpkin Mini Rolls! the lovely warming spices of cinnamon, ginger and all spice. great way of using pumpkin. These Blackcurrant & Liquorice Spider Cupcakes, made by myself in the Only Crumbs Remain kitchen are super easy to make. The blackcurrant cupcakes are topped with a ‘scary’ liquorice legged spider! some wonderful flavours to create a Pumpkin & Plum Conserve Steamed Pudding! Do check out her recipe where she shares some great tips if your new to making your own steamed puddings. If you’re looking for recipes to use up pumpkin puree, how about in Monika’s Dairy Free Pumpkin Brownies? Three words to describe Jo’s Pumpkin Cinnamon Muffins with Plum Jam: Autumn. Easy. Yummy. natural sweetness! Debbie incrorporated a generous handful in her Spiced Pumpkin Muffins with Dates and Coconut Sugar which must have been so good with the warming spice and pumpkin. Debbie, of proper Foodie, who created this batch of delicious Parkin, with its warming ginger spice and packed with dark black treacle. Yum! finishes it with a smoked salted caramel sauce! Bring on bonfire night! fabulous Irish Coffee Cake (or cupcake!) with Baileys Cream from Jacqui over at Recipes Made Easy. I can just imagine it being a great addition to a festive buffet this year! it’s also nut free, rice free and can be made dairy free too! Need I say more than Jaffa Cake Celebration Cake? Other than get the kettle on Jenny, I’m popping round for a slice! I just adore the chocolate-orange combo! Apple and cinnamon is winning combinaton for so many people, so how about trying it in Rebecca’s free-from apple and cinnamon cake recipe! It’s such a great way of using up a few apples. Once you have your dessert, the next decision is custard, cream or ice cream! preferred cream, custard or ice cream. I must admit I’m a custard sorta gal! Just check out the beautiful crimp to Rebecca’s gluten free Old Fashioned Apple Pie crust! I’m more than sure Paul Hollywood would be impressed. How does Toffee Apple & Pecan Steamed Pudding grab you? Well it certainly was a winner with Helen’s family. I’ve no idea why ? spiced seasonal fruits and is low in refined sugar. And if you’re a little unsure how to easily create a pretty lattice crust why not watch our short video. crumbs everywhere from smashed biscuits, then check out Lucy’s trick in her recipe for Easiest Rocky Road! She describes it as the ‘ultimate in lazy baking’. like Cat has of Curley’s Cooking, I think the answer is a resounding yes! thing in whole wide world”! You can’t get better than that! marries together the popular flavours of chocolate coffee and walnut! healthier version with her recipe for Baked Nutella Doughnuts! as the doughnuts). Seriously tempting! If you’re looking for a post school treat for your family, then allow me to introduce you to these Cinnamon AppleSauce Muffins from Corina at Searching for Spice! They sound so scrummy, if only I could reach in through the screen and grab one! How professional and inviting do these Chocolate Eclairs look from Rebecca at Glutarama? And can you believe they’re gluten free too! custard! I kid you not, check out her recipe and see for yourself! 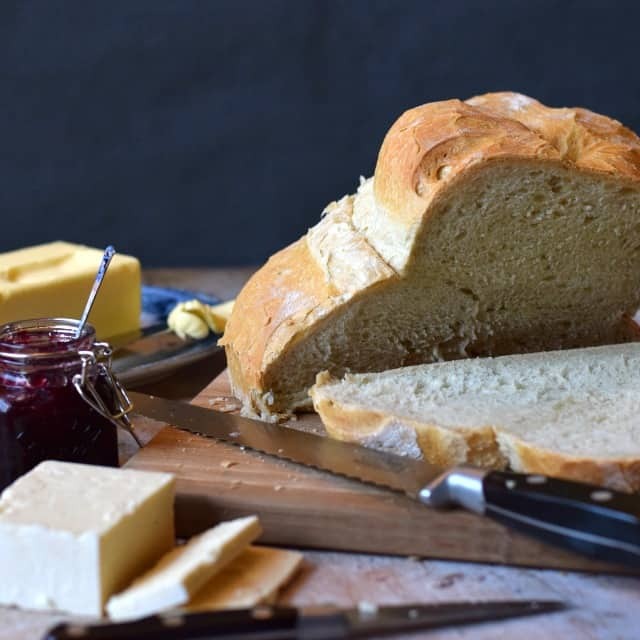 You know how difficult it can be to choose what to order from a delicious menu, well deciding what to bake from all of the wonderful enteries shared in the #BakingCrumbs linky is just like that! Seriously, this month I could once again have made so many things from steamed puddings to keep us warm in the colder evenings, to crumble, and a number of easy bakes as a wind-down to the complexity of baking along with GBBO! And let’s not forget Johanna’s Choc Caramel Doughnut Sundae! But the dilema of what to bake this month was solved when one of Mr E’s work colleagues whispered 3 little words in his ear! Chocolate. Caramel. Brownie! You see many of our bakes are shared with his work colleagues (we’d end up the size of a house-end otherwise! ), so when Jacqui asked if I could make a batch of Chocolate Caramel Brownies the other day I knew exactly where to get the recipe! 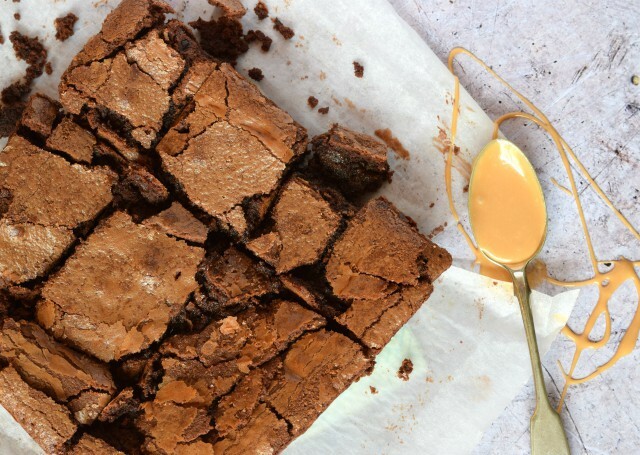 Cat, of Curley’s Cooking, shared a fabulous Chocolate Caramel Brownie recipe which is super soft, squidgey, chocolatey and incredibely indulgent & decedant. And just to confirm it went down a blast with Mr E’s colleagues with the recipe being requested! I must encourage you to check out Cat’s recipe for Caramel Brownies! Now onto November’s #BakingCrumbs Linky. Feel free to Tweet me @Onlycrumbsremai (the ‘n’ is missing – I ran out of characters!) using the hashtag #BakingCrumbs and I will re-tweet all those that I see. You are also invited to join the Baking Crumbs pinterest group board! Please note, by linking up you are giving me permission to use your photograph in the round up and on social media. I will be commenting on all of the bakes entered into the #BakingCrumbs linky. I will also be sharing your delicious bakes on Twitter, as well as Stumbling and Yumming them (where there is a ‘Yum’ button)! I shall include a full roundup the subsequent month (usually on the 1st), as well as highlighting my favourite bake from that month’s collection! What a lot of lovely baking inspiration. I am pleased to have something to add this month to join you. Hahaha, I know just what you mean Midge – some seriously very tempting bakes! Wow! This is a list of some extremely palatable treats which I will have to try! I especially loved the recipes for the Bonfire Night, Angela! Aw thankyou so much Jo, but in all reality it's all down to the fab bakes that people like yourself share 😀 Those brownies were so lush, they didn't stand a chance when hubby took them into the office! I think there was a stampeed of folk rushing to get a slice 😉 Defo one to make again. Haha I know, I should have included a warning that I was going to mention Christmas! It's surprising how fast it comes round, but I completely agree the supermarkets really do start with the Christmas thing far too early – I saw some festive dog treats back in August! Some lovely bakes here Angela. I was too late to add my Craquelin buns to the Bake Off linky so I thought Id be the first and add them her. Look forward to see the other lovely bakes that are linked up. Aren't there just Jacqui – so much inspiration, there is definitely something for everybody 🙂 I'm really looking forward to reading about your carquelin – I've only just started to get to grips with choux so have never tried craquelin – I must say from what I've seen already it looks really effective 😀 Yes, I'm also looking forward to seeing the bakes this month. Aw thankyou Cat, I'm definitely having to take my pictures earlier in the day now that the days are getting shorter. oh wow, so many great bakes again. I'm looking forward to seeing what everyone bakes in November!